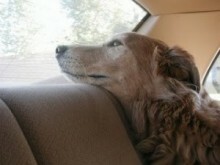 Most of us are all too familiar with the feeling of dread that comes upon us when we pass by the window of a car and realize that a dog has been left inside on a hot day. What should I do? Do I break the window? Do I call the police? Do I try to find the car owner? There’s no easy answer, unfortunately, and those decisions are ones that only you can make, but now you can be better prepared for your next encounter. “My Dog is Cool” is a campaign designed by the RedRover animal protection charity to educate people about the dangers hot weather poses to dogs. Throught their “Don’t Leave Me in Here — It’s Hot!” fliers and posters, you can have what you need on hand to try and influence the behavior of dog guardians who need a reminder about the dangers of hot cars. These are great to place on a windsheild of an offender’s vehicle or to hang on the door of a local business willing to notify their customers that leaving pets in the car is not okay during warm weather.